The boundaries of Chicago Wicker Park/Bucktown are Armitage Avenue to the north, to the south is Chicago Avenue, to the east is I-90/94 and Western Avenue on the west border. Chicago Wicker Park/Bucktown area became part of Chicago in 1837 and since then, it went through many major changes to become the very popular neighborhood it is today. Back in 1870 two brothers Charles G. Wicker and Joel H. Wicker, both developers at the time, purchased 80 acres of land and started to build Wicker Park/Bucktown neighborhood. They started building the streets and constructing drainage systems.While building they donated 4 acres to the city of Chicago as a public park which the city created a lake within the park called Wicker Park and that is where the neighborhood got it's name. Following the Great Chicago Fire of 1871 when many of the homes made from wood burned down, many residents in the area began to build new homes out of brick and stone in a variety of architectural styles centered around the 4-acre park which created a beautiful residential area. Some of the most well know residents were the Pritzkers, Saul Bellows and Nelson Algren. Wicker Park/Bucktown was very unique from the beginning in that there was a mix of neighbors all living next to one another. The wealthier neighbor lived next to a working class neighbor, and everyone originated from a different part of the world. Germans and Scandinavians, Polish and Israeli's, African Americans,Eastern Europeans and more. In the 1930's the wealthier residents moved from the area for more gentrified neighborhoods then their mansions were divided into apartments and boarding homes. Around 1980, young professionals started moving back into Wicker Park/Bucktown and began restoring these old mansions to their previous single-family zoning. This did displace much of the working class, but then in the 90's Chicago artists and students started moving into the area, attracted by its affordability at the time and proximity to the Loop. Today, buildings continue to be restored, some old buildings being replaced by new and as more and more Chicago restaurants, bars and shops open in the neighborhood, also health care centers, day care centers, schools, churches, the area caters to a steadily increasing diverse mix of people who are proud to call Wicker Park-Bucktown their home. 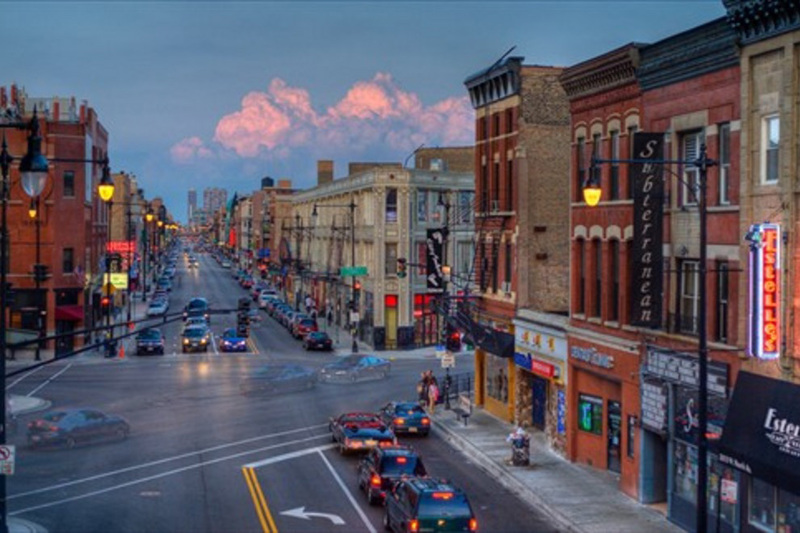 Wicker Park/Bucktown was designated a Chicago Landmark District in 1991.